About "HCF and LCM problems"
In this section, we are going to see, how to solve problems on HCF and LCM step by step. The H.C.F of two or more numbers is the greatest number that divides each of them exactly. 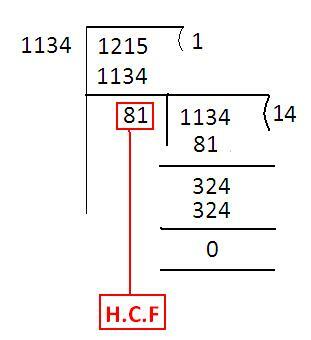 Find the H.C.F of 108, 288 and 360. Let us see, how H.C.F can be found for the given three numbers. First let us write the given numbers as the product of prime factors. 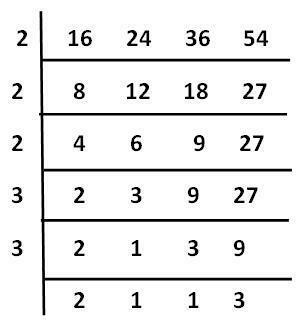 When we look in to the prime factors of the given numbers, we find 2 and 3 in common of all the three numbers. The least power of 2 is 2 and 3 is also 2. Now, to find the H.C.F, we just have to multiply 2² and 3². To find the H.C.F of two given numbers using division method, please follow the following steps. Divide the larger number by the smaller one. You will get some remainder. Now, divide the divisor (smaller one in the above) by the remainder of step 1.When you do so, again, you will get some remainder. Again you have to divide the divisor (remainder of step1) by the remainder of step 2. We have to continue the same process, until we get the remainder zero. It has been clearly shown in the following HCF and LCM problems. Find the H.C.F of 1134 and 1215. In the above example, the larger number is 1215 and the smaller number is 1134. As we explained above,we do the following steps. We divide the lager number 1215 by the smaller number 1134. When we do so, we get the remainder 81. Now we divide the divisor (1215) by the remainder of step 1 (that is 81). On continuing this process, we get remainder zero when we divide the divisor of step1 (that is 1215) by the remainder of step2 (that is 81). Here the H.C.F is 81. Because we get the remainder zero when we divide by 81. From the above example, it is very clear that H.C.F is nothing but the divisor for which we get the remainder is zero. If we want to find H.C.F of three numbers, first find H.C.F of any two numbers. Then, H.C.F of [H.C.F of two numbers and the third number] gives H.C.F of three numbers. In the same manner, H.C.F of more than three numbers may be obtained..
Resolve each one of the given numbers in to a product of prime factors. Then, L.C.M is the product of highest powers of all the factors. Find the L.C.M of 108, 288 and 360. Let us see, how L.C.M can be found for the given three numbers. To find the L.C.M of two given numbers using division method, please follow the following steps. Arrange the given numbers in a row in any order. Divide by a number which divides exactly at least two of the given numbers and write the remaining numbers as it is. Repeat the same process till no two of the numbers are divisible by the same number except 1. The product of the divisors and undivided numbers is the required L.C.M of the given numbers. It has been clearly shown in the following example. In the above calculation, the divisors are 2,2,2,3,3 and undivided numbers are 2,1,13. To find the L.C.M, we just have to multiply the divisors and undivided numbers. Hence, the L.C.M is 432. 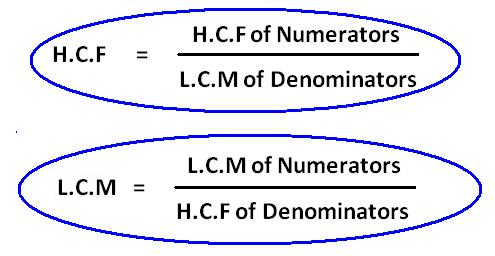 If the H.C.F of two numbers is 1, they are called as co-primes. Because, the H.C.F of 3 and 4 is 1 That is, there is no common factor between them except 1. After having gone through the stuff given above, we hope that the students would have understood "Hcf and Lcm Problems". Apart from the stuff given on "Hcf and Lcm Problems", if you need any other stuff in math, please use our google custom search here.